Keep track of your expenses directly from your phone. Know exactly how much you spent during the month and examine your spending habits by explanatory graphics. 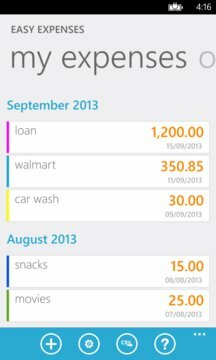 Easy Expenses allows you to keep track of your expenses in a simple, beautiful way! - Easy and friendly interface. - You can assign categories. 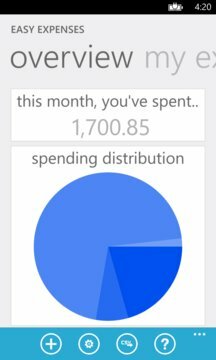 - Monthly summary of what you spend. - Secondary Tile to enter your expenses quickly. - Expense grouping by month. - Backup and restore to and from SkyDrive (*)(**). - Export your expenses as a CSV file to SkyDrive (**)(***). - ...and more features coming soon! ** Uploading to and authorizing SkyDrive requires a Wi-Fi or Cellular Data Connection (carrier charges may apply). *** You need to enable SkyDrive access via in-app purchase first.